Do you love following the latest trends or do you prefer sticking to timeless designs? Are you more of a wood person or a stone one? No matter what your preferences may be, vinyl has options for you. Explore the showroom at Flooring America to browse one of the most diverse selections of vinyl flooring in Great Falls, MT. Our staff members are on hand to help you find the perfect surface to complement your décor and upgrade your home. Thanks to recent manufacturing innovations, vinyl now offers more value than ever before. For example, homeowners love how easy it is to clean and maintain. Routine sweeping or vacuuming is all it takes to keep the surface dust and dirt free. Any stains or grime can be dealt with using nothing more than a damp mop and perhaps a gentle floor cleaner. For more vinyl maintenance information, talk to our sales associates. In addition, vinyl tile flooring, plank flooring, and sheet flooring are all specially built to hold up to heavy foot traffic and daily wear and tear. Vinyl is difficult to crack, scrape, or stain, not to mention it is also water resistant. These properties make it ideal for kitchens, bathrooms, laundry rooms, and homes in humid climates. Finally, vinyl is one of the most versatile flooring materials around, able to mesh well with practically any design. Vinyl’s versatility makes it simple to find the ideal surface to complete your room’s look; regardless of what look you’re going for, there’s a vinyl product for you. To get a recommendation tailored to your interior design goals and performance expectations, visit our store today. Vinyl comes in many different forms, including vinyl tile, vinyl plank, and vinyl sheet flooring. Each style has its own unique look and advantages, so it’s important to choose the one that’s right for you. 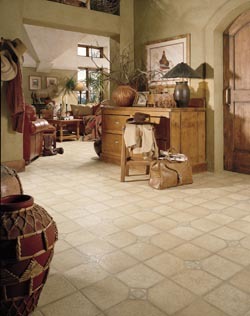 Vinyl tile surfaces mimic the appearance of tile flooring. Thanks to vinyl’s limitless design potential, any size, shape, or style of tile can be reproduced with vinyl. Likewise, vinyl plank flooring imitates the natural beauty of hardwood, including the different species, planks sizes, and finishes. These two types are installed piece by piece; sheet vinyl, on the other hand, is laid down in large sheets for quicker installation and more water resistance. To learn more about the different types available at our flooring store, visit us or call us today. Contact our showroom for further information on our vinyl products. We proudly serve clients from throughout Great Falls, Monument, Black Eagle, Vaughn, and Fort Shaw, Montana, as well as the surrounding areas.